Wildlife isn't always restricted to wild spaces. Avocado orchards and other agricultural landscapes also buzz with species that forage and reproduce in these spaces. Birds and herbivores are able to find food and shelter in these cultivated areas, but what about carnivores? In a study published in PLOS ONE, researchers at the University of Washington have discovered that mammalian carnivores also occupy avocado orchards in southern California. 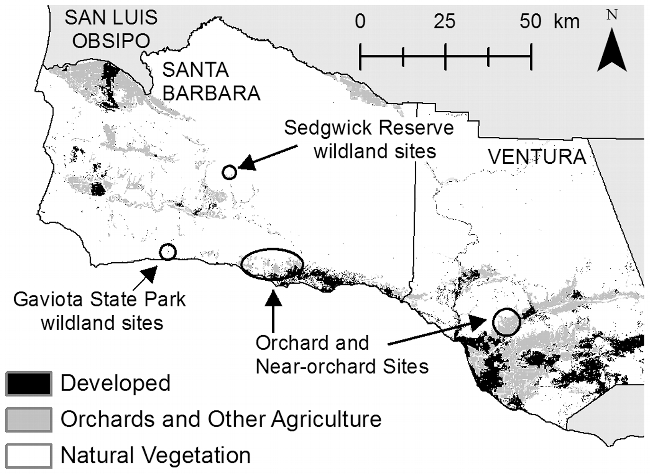 The authors used motion-activated cameras to observe animals in orchards and in adjacent wild lands in Santa Barbara and Ventura. 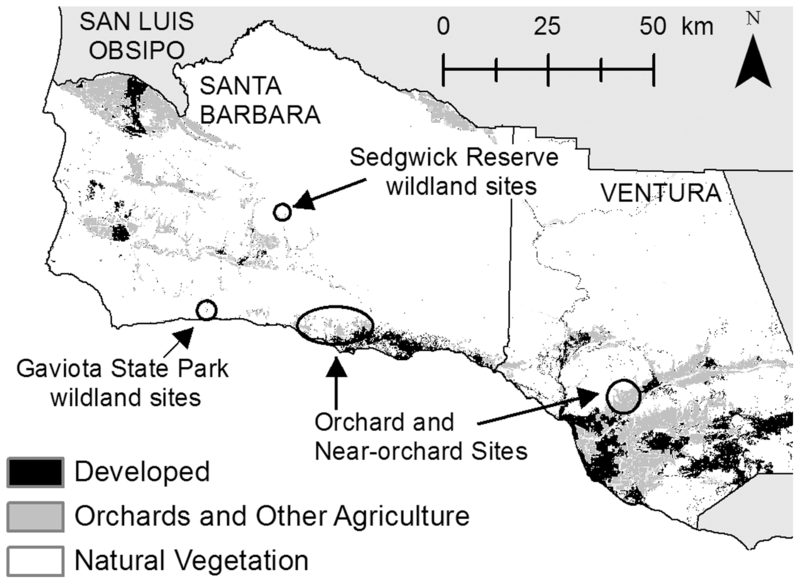 Avocado orchards were of particular interest due to their location near native vegetation. Through their investigation, the researchers detected more carnivores in the avocado orchards than in neighboring wild land sites. At least 7 out of the 11 native carnivores in the area were spotted roaming the orchards, including bear, coyotes, gray foxes and bobcats. Having delicious avocados handy may explain why some omnivores such as bears and raccoons are present in the area, however, little is known about why animals like bobcats and mountain lions might leave their wild habitat for cultivated land. One possibility is that the orchards provide water and fruits for herbivores, and an increased herbivore population could translate to more prey for the carnivores. The orchards may also serve as shelter, offering forest cover similar to oak woodlands in the area. These native species cannot always persist in protected reserves, so it is important to learn how cultivated lands can serve their lifestyle and behaviors. The carnivores may not be searching for the perfect guacamole ingredient; however there is no doubt that the avocado orchards are serving as a habitat for a wide range of species. Wild pigs currently exist in 56 of California's 58 counties and can be found in a variety of habitats ranging from woodland, chaparral, meadow, grasslands and in agriculture cropping systems. Wild pigs are commonly found in the foothill areas, and they prefer areas of dense brush, however the drought has led them to encroach into orchards. Wild pigs can cause significant damage to farm and rangelands, natural resources, environmentally sensitive habitats, and property. Wild pig depredation on livestock and poultry can cause high economic loss (Choquenot et. al. 1996). Also, wild pigs can carry a number of diseases and parasites that can be transmitted to livestock, wildlife, and humans. In California, wild pigs can be carriers of Brucellosis, Cholera, Leptospirosis, Tuberculosis (Bovine, Avian, and Swine), Q fever, Trichinosis, Toxoplasmosis, Pseudorabies, and Plague (Barrett and Tietje 1993). Domestic swine were imported to the United States by European settlers in the 1700s. Whereas Domestic swine foraged freely, eventually becoming semi-wild, or “feral” (CDFW 2017), California's wild pigs were descendants of the Eurasian wild boar, introduced to Monterey County, California in the 1920s. 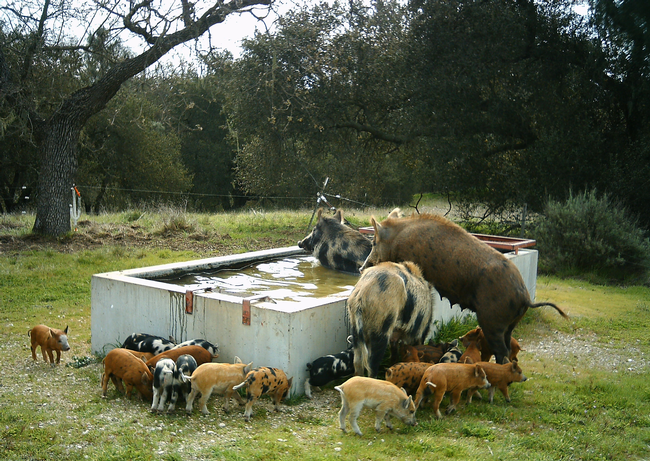 The physical characteristics of California's wild pigs vary significantly throughout the state. Some exhibit the long hair and snouts, small erect ears and angular shaped bodies of their wild boar ancestors, while others have short hair, long floppy ears, and a barrel-shaped body. Colors range from solid black to red, striped, grizzled or spotted (CDFW 2017). Domestic pigs that are unmarked and roam freely are also considered to be wild pigs. Evidence of wild pigs' presence is obvious even if you don't see them physically. Wild pigs use their snouts to root up the ground in search of food, including plant roots, fungus, and other items. Wild pigs are omnivorous, consuming both plant and animal matter. In general, wild pigs feed on: grasses and forbs in the spring; mast and fruits in the summer and fall; and roots, tubers and invertebrates throughout the year. Wild pigs will feed on insects and underground vegetation. This rooting behavior can disrupt parts of the orchard floors. it could lead to the trees becoming susceptible to root rot diseases that could spread throughout the grove. They are also known to eat fruit off of the lower branch scaffolds. Pigs will contribute to erosion which can affect water quality and also create large uneven basins, or wallows in moist soil during hot weather. Both rooting and wallows can disrupt the application of irrigation water by ruing or displacing irrigation equipment and resulting pools can become breeding habitat for mosquitoes. Wild pigs can also create a food safety issue. Growers are now required to show a Food Safety Good Agricultural Practices for California Citrus Growers (GAPs). This practice is focused on the grower's particular role in providing safe citrus fruits for consumers. The grower should assess the impact of domestic, livestock and wild animal activity for potential pathogen contamination of the grove and fruit. The assessment should include the extent of intrusion, nearness to the grove, proximity to harvest and other relevant factors. Based on the assessment, the grower should put into place measures to exclude domestic animals and minimize the intrusion of wildlife into the grove. The grower should monitor the grove and adjacent land for evidence of animal activity and the potential for contamination of fruit or equipment. The grower should return bins to packers if there is evidence of contamination. 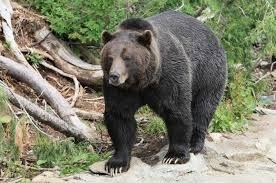 o Evidence of animal intrusion such as downed fences, presence of live or dead animals, animal tracks or animal feces. If animal intrusion is detected, measures shall be taken to remove or prevent from harvest any potentially contaminated product. o Presence of potentially contaminating materials (e.g. 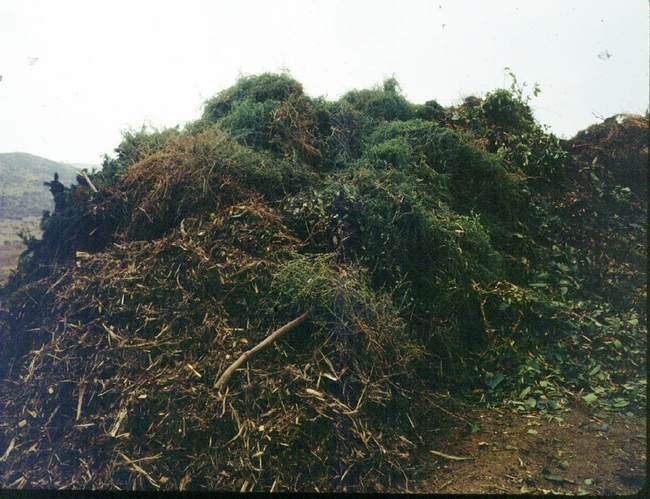 uncomposted manure, etc.) likely to pose a contamination risk to the grove to be harvested. o Evidence that the irrigation water source and delivery system may potentially be compromised. MANAGEMENTClassified as a game mammal in California, wild pigs provide year-round hunting opportunity and fall under the jurisdiction of the California Department of Fish and Wildlife (CDFW). A hunting license and a tag is required to hunt wild pigs. If wild pigs are causing damage to your property, pigs can be trapped or shot, but this requires a depredation permit. Contact your local CDFW representative for further details on depredation permits (https://www.wildlife.ca.gov/Conservation/Mammals/Wild-Pig/Depredation). Fencing can be extremely effective but because of costs it can be extremely prohibitive. However, on smaller scales, exclusionary fencing can be an effective option. One of the most effective designs seems to be the installation of sturdy wire mesh fencing. The bottom wire should be either tightly stretched on the ground surface or buried. The addition of an electrified wire about 6 to 8 inches off the ground is also recommended. The fence should be at least 36 inches high. Electric fencing alone has also been shown to restrict the movement of wild pigs also. Poorly designed and constructed fences will significantly increase repair and maintenance time. It is important to carefully consider the costs and benefits of fencing for pig exclusion before embarking on such a venture. Trapping can be an effective method of removing wild pigs from your orchard. The most commonly used traps are box traps and corral traps. Corral traps are much larger than box traps and are designed to capture multiple pigs. It is important to consider that all wild animals can be unpredictable when approaching captured pigs. In some counties, the agricultural commissioner has trappers who can assist; other counties have contracts with USDA-Wildlife Services to assist with problematic pigs. Currently there is one toxicant registered for use on wild pigs in the United States (EPA Reg. No. 72500). This product is not currently registered for use in California. This product may only be used to control wild pigs on pastures, rangeland, forests, non-crop areas, and crop lands. This bait may only be applied in hog feeders equipped with heavy lids (8 to 10 lbs. of total weight) on bait compartments so as to limit direct access to bait by nontarget animals. This product may be toxic to fish, birds and other wildlife. Dogs and other predatory and scavenging mammals and birds might be poisoned if they feed upon animals that have eaten the bait. Wild pigs must be conditioned to accept feed from the bait dispensers and to open the weighted lids to bait compartments. Repellents are not generally considered effective against many mammalian pests and this is also true for the management of wild pigs. UCANR is asking California growers and landowners to help keep track of the state's wild pigs and the damage they are causing through a new Wild Pig App. The app is available for download on Apple and Android devices and will collect information on wild pig damage throughout California. Cell service at the site of pig damage is also not required to collect the information. The information collected will be used by University of California Cooperative Extension Specialists and Advisors to learn more about wild pigs in the State. Download the app at your App Store to participate in the wild pig damage project without the app, landowners and growers can fill out a short survey at http://ucanr.edu/wildpig2016. California Department of Fish and Wildlife <https://www.wildlife.ca.gov/Conservation/Mammals/Wild-Pig> Accessed: 24 July 2017. Barrett, R. H., and W. Tietje. 1993. The wild pig in California oak woodland: ecology and economics. Conference Presentation Summaries. Univ. of California, Berkeley. Hamrick, B., M. D. Smith, C. Jaworowski, B. Strickland. 2011. 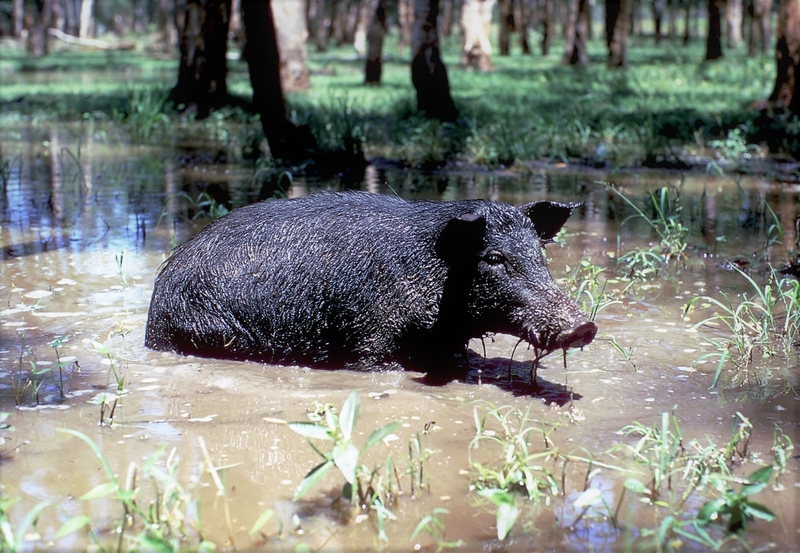 A Landowner's Guide for Wild Pig Management(PDF). Publication 2659. Sweitzer, R. A. and D. H. VanVuren. 2002. Rooting and foraging effects of wild pigs on tree regeneration and acorn survival in California's oak woodland ecosystems (PDF). USDA Forest Service General Technical Report PSW-GTR-184. Which Way Mulch in Ag? Paul Noring, President, Main Street Materials, Inc.
Andy Trotter, Vice President-Field Operations, West Coast Arborists, Inc.
Michael O'Connor, Director, North America Sales Division, Air Burner, Inc.
Michael O'Connor, Director, North American Sales Division, Air Burners, Inc.
As most orchardists and pest control advisors are well aware, glyphosate-resistant weeds have been one of the biggest weed management challenges in California orchard crops for several years. Depending on where you are located in the Central Valley, your biggest challenges in the glyphosate-resistant weed department are probably one or more of the following winter annual weeds. In the San Joaquin Valley, hairy fleabane and horseweed (also known as mare's tail), dominate. In the Sacramento Valley and in some North coast areas, annual or Italian ryegrass is more common. For an extra challenge, many growers have a mix of several of these, in addition to their other common orchard weed spectrums. In developing management strategies for these winter annual weeds, we've typically focused our herbicide-based programs on timely applications of preemergence herbicides. Because preemergence herbicides generally work on germinating weed seed or very small seedlings, “timely” applications for these winter annual species usually means getting the herbicide treatments out in late fall or early winter. In normal rainfall seasons, this timing ensures water-incorporation of the herbicide at about the same time as the seeds germinate and, hopefully, good control. Mission accomplished, right? Recently, we've been seeing new glyphosate-resistant weed challenges that require a different management approach. The species I mentioned a moment ago are all winter annuals, which means they typically germinate and emerge during our cool season and reach a reproductive stage by spring or early summer. 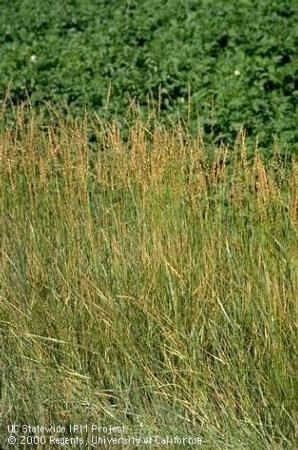 However, several recently confirmed (or suspected) glyphosate-resistant species are summer annual grasses. Summer annual weeds typically germinate and emerge as our season warms up in the late spring and early summer and they grow well into the summer before reaching maturity. A few examples include junglerice, threespike goosegrass, and several other glyphosate-questionable species such as feather fingergrass, sprangletop, and witchgrass. So, how do these grasses present such a different challenge? The challenge with glyphosate-resistant summer grasses is that even though we have a number of good preemergence herbicides that can work very well on grasses, these species emerge long after our typical orchard preemergence herbicide programs are applied. Thus, herbicide programs that are applied during mid-November to mid-February targeting winter annual weeds sometimes fail to control summer annual weeds that emerge in May-July. If spring applications of foliar materials like glyphosate fail because of resistance, problems can quickly become apparent. How can we use our existing preemergence herbicide tools to help address this problem? To answer that question, it's useful to think about what happens to a preemergence herbicide when you apply it to the soil. Herbicides “dissipate” in soil, a term that encompasses a suite of processes by which the herbicide is either broken down or made unavailable. Chemists use terms like “half-life” to describe differences in dissipation rates but this doesn't exactly get at our interest in weed control performance. From a performance standpoint, it's more useful to think of a herbicide concentration threshold. When the amount of herbicide in the soil solution is above the threshold for a certain weed, it remains effective on that weed. However, dissipation processes will eventually reduce the herbicide concentration below the threshold and the herbicide begins to “break”. The threshold may occur at different levels for different weed species and dissipation rates may vary in different areas of the fields (wet vs dry areas, for example). 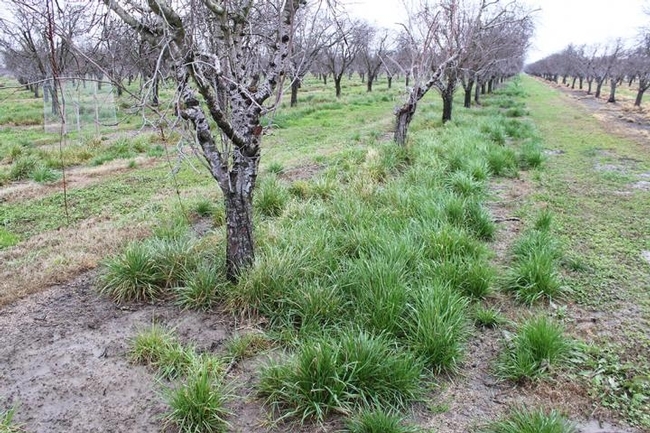 Use a sequential approach to preemergence programs in orchards. Mixtures: Using herbicide mixtures, particularly products with different modes of action, is a great strategy for managing and delaying herbicide resistance but doesn't really help in this situation. Because herbicide dissipation rates are affected primarily by the chemistry of the individual herbicide and the environmental conditions, a tankmix will not exactly help extend the residual control beyond what we'd expect from the longest-lasting material. Or, to say it another way: if you mix a short residual herbicide with a long residual herbicide, one will last a short time and the other a long time but the mix will not last longer. Higher rates: Many, but not all, preemergence herbicide labels have a range rates registered in a crop to account for differences in soils, required level of control, weed spectrums, etc. Within the labeled rate, it stands to reason that given similar dissipation processes, a higher rate will result in the soil concentrations of the herbicide remaining above the efficacy threshold for a longer time than a lower rate. This is generally true and is a common approach when we only have one opportunity to make a preemergence herbicide application. However, I think this is an indirect way to approach the problem of summer grasses in orchard crops. Sequential approach: In the orchard cropping system, some growers may want to consider using a sequential approach to available preemergence herbicides to tackle problems with glyphosate-resistant summer annual grass weeds. Conceptually, this approach simply moves a portion of the winter preemergence herbicide program to a bit later in the year to late winter or early spring. A preemergence herbicide with activity on summer grasses would be applied along with the grower's spring burndown herbicide program and, thus, would be present in the soil solution much closer to the timeframe when summer grasses begin to germinate and emerge. Importantly, I think this could be achieved in many situations with no significant changes in cost, number of field operations, or negative environmental impacts. Illustration: An almond grower who typically uses an effective preemergence program (pick your favorite program) applied around the first of December followed by a March “cleanup” treatment with glyphosate may still have difficulty managing glyphosate-resistant grasses. The grower knows that herbicides like oryzalin or pendimethalin (eg. Surflan or Prowl H2O) could help with grasses. Using the higher rate approach, the grower could use a high label rate one of these materials in December with the idea that it will persist long enough to control summer grasses emerging six months later. Using the sequential approach, the grower could move all or part of the oryzalin or pendimethalin component of the program to the March timing to more directly target those summer germinating grasses, possibly at a the same or even lower total application rate. Who might want to consider a sequential approach? This approach requires a bit of close management attention. First, because incorporation of preemergence herbicides is key to their performance, moving some of this product to late spring will require either timely rain or overhead irrigation capabilities. Growers with solid-set or micro sprinkler systems should have little problem with this, but single- or double-line drip irrigated orchards will need to get a rain and should not delay too late in the spring. Second, moving all or part of the preemergence grass herbicide to late in the year requires that growers know their weed spectrum. If you know or suspect glyphosate-resistant summer weeds, this may be an approach to consider. You should also have an idea of what weeds you are managing during the winter season too and make sure that your winter program still addresses that part of the weed spectrum. Weed management in orchard crops is complex and getting further complicated by new glyphosate-resistant weeds. Because of our relatively mild climate and seasonally variable temperature and moisture conditions, we encounter weed germination and emergence in every season. Strategies to manage one fraction of the weeds present in a given orchard may not work equally well for other species. Handling shifting weed problems may require different approaches in order to make the most effective use of existing weed management tools.